We are all used to online shopping now, the process is relatively easy, you order a product, choose a delivery address (usually your home) and a few days later or even the next day it arrives. Easy. But when it comes do delivering to your new University address, especially if you are living in Student halls the process can become more confusing. In this short guide we will tell you how to ensure your deliveries reach your new University home safely. We have delivered thousands of packages to Universities across the UK and our experience informs this guide. If you are living in University halls the first thing you need to is find out your new postcode, this is usually given to you a few weeks before you start. Let’s say for example that you will be living in Ramsay Hall – The UCL halls of residence. Your postcode is W1T 5HB. However this postcode is not allocated to your actual room, it is the postal address of your Ramsay Halls postal room. When you place an online order you will use that postcode in the shipping address but you should also put your room number in as well. That way when you arrive or University or during your stay you simply contact the post room and collect your letter or parcel from there. It is a common misconception that you cannot have large packages delivered to University postal rooms, we have seen everything from TV’s to bikes delivered! Some halls of residence may prefer you to address packages to their front desk or reception, the process is exactly the same as sending parcels to a postal room – make sure you include your room number. University accommodation managers are used to handling and receiving letters and parcels for their students, so do not feel like it is ‘putting them out’ or strange that you need items delivered on the day you arrive at University or during your stay. Most students will be in exactly the same position. When collecting parcels from a University post room or front desk it is important that you carry ID with you, so they know they are giving it to the right person! If you are still unsure what your accommodations procedures are for taking deliveries we recommend you contact your University accommodation or student services teams directly. Alternatively let us know the details of your new address and we will call them for you! At My Student Essentials we understand that the first days of University can be slightly hectic as you get to grips with your new accommodation, town and course. So we always ensure we work closely Universities, our hauliers and other accommodation providers to ensure your package arrives safely and on time. 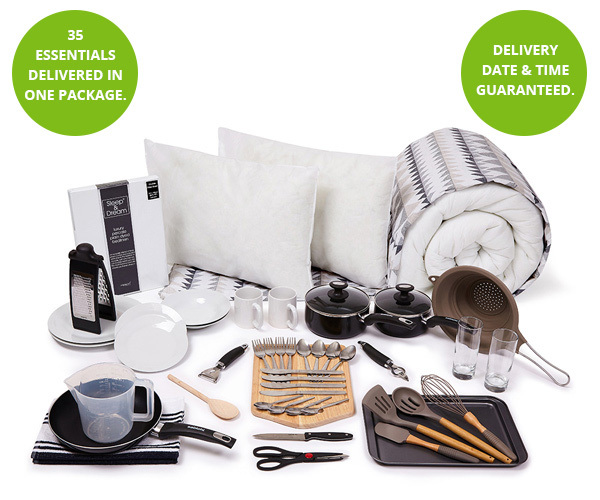 You can choose to have your My Student Essentials Bedding, Kitchen or All In One package delivered on any day that works best for you, including the weekends. You can also choose to have your package delivered before 9am. Remember, if your package doesn’t arrive on the day you choose we will send you £20 cashback straightaway!